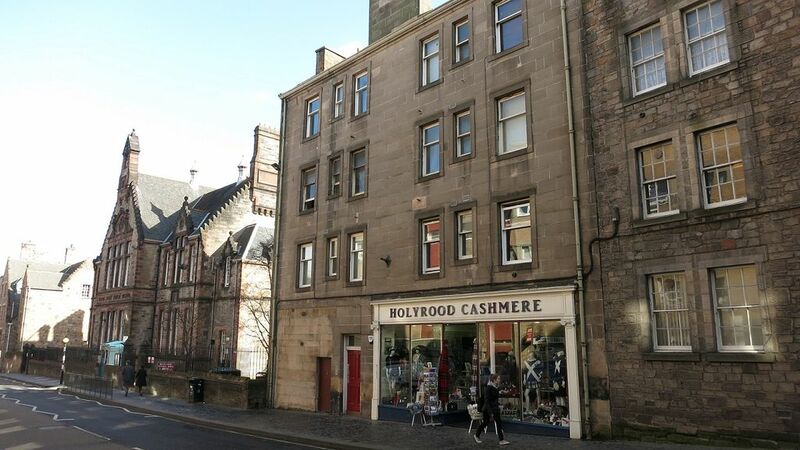 One bedroom first floor flat in a superb central location on the historic Royal Mile. The flat is newly refurbished and furnished in a comfortable modern style. We hope you enjoy the Edinburgh and Scottish-themed artwork in the flat by a local artist. The bedroom has a double bed and is located to the back of the building away from the street ensuring a quiet night’s sleep. There is a sofa bed in the lounge that sleeps one person comfortably. Please let us know if you require the use of the sofa bed and we will arrange bedding. The lounge also has a TV, DVD player and fast Wi-Fi throughout, as well as a dining area. The kitchen is fully equipped with a dishwasher, fridge, freezer, washing machine, oven, stove and microwave. The flat has a separate shower room and a toilet. You will also have access to a communal roof terrace. shower, With sink and storage underneath sink. The apartment has a shower room, which also has a basin with storage space underneath. There is a separate toilet. Two electric heaters in the living room. Night storage heaters in hallway and bedroom. Electric fan heaters in shower room and toilet. Washing machine is discreetly installed within a kitchen cupboard. We provide detergent and a rack for drying clothes. Living room has a feature electric fireplace. On-street parking is metered and pay-and-display car parks are located nearby. Bath, hand and kitchen towels, and a bath mat are provided. The apartment has a table-top dishwasher. Dishwashing detergent is provided. The kitchen has a full fridge and freezer. We provide tea, coffee, sugar and milk. Condiments including salt and pepper. Kitchen has all cooking utensils and dishes (pots, pan, oven dishes). Plates, bowls and cutlery come in sets of eight. The kitchen is fully equipped with a dishwasher, fridge, freezer, sink, washing machine, oven, stove and microwave. The kitchen, like the entire apartment, is not shared with other units. The lounge has a dining area by the window that can be modified to accommodate 1-4 guests. Modern HDTV (1080 32'), connected to a DVD player. Outdoor and Scottish-themed books, guide books and novels. Range of DVDs including thriller, drama, adventure and romance. A communal terrace with access from the internal stairwell. Key provided in the apartment. The location is perfect and the flat is clean and comfortable. We had a such a good time we are going back! The apartment was very clean and comfortable. It was well appointed with a good range of kitchen utensils/ crockery etc. Although the main street entrance may be a little off putting, this should not in any way detract from the apartment. It was in an excellent location and easy to find. The hosts provided excellent information in regard to transport links. There was barely any noise from neighbours. The shower was well sized with good water pressure. Perhaps the only very slight niggle was that the towels were a bit scratchy but I feel that this could be easily remedied. There was plenty of space for 2 people although it would have been nice to have 2 bedside tables instead of just the one. The hosts had thoughtfully provided some DVDs and books as well as tea bags and coffee. Also, they had installed a automatic light above the front door which helped with putting the key in the keyhole. I would certainly recommend this apartment. Had a wonderful two days made even better by a lovely apartment. The apartment was great for 2 people. It was warm, and had everything we needed for a comfortable stay. Highly recommend! Great little flat right on the Royal Mile! The flat was in just the perfect location for all the sightseeing we wanted to do. Well equipped for the two of us with separate bedroom and living area. The living area, kitchen, and bathrooms were clean and set up with everything we needed. Convenient check in routine. Fun & bustling part of town by day and very quiet by night. On the Royal Mile, the apartment is ideally located for exploring the City of Edinburgh. Within 200 metres of both Holyrood Palace and the Scottish Parliament building, it is a perfect base for sightseeing on foot. Alternatively, Edinburgh bus tours pass outside the building and are the ideal way to see the city and the major attractions during a city break. Almost all of Edinburgh's main attractions are within easy walking distance, including the Castle, museums, major galleries, Festival and Fringe venues, and Arthur's Seat and Calton Hill. There are many places to eat and drink close to the property. Waverley (for trains and airport transfer via the Airlink 100 bus) is less than a ten minute walk away.